Nasir el-Rufai, governor of Kaduna state, has described the 8th senate under the leadership of Bukola Saraki as the worst in the history of the nation. 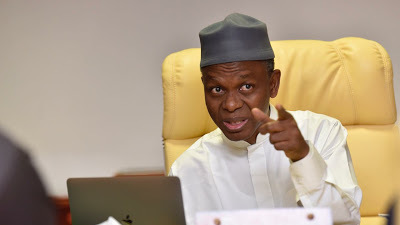 Speaking in an interview aired on some local radio stations in Kaduna on Thursday, the governor accused the senate president of listing some members of the ruling All Progressives Congress (APC) among those who defected to the Peoples Democratic Party (PDP). He said many of those in the national assembly “rode to power on the back” of President Muhammadu Buhari. El-Rufai also expressed optimism that Adams Oshiomhole, chairman of the ruling party, would resolve APC crisis. He also blamed the three senators representing the state for the inability of his administration to complete ongoing projects. The senators are Shehu Sani (Kaduna central), Suleiman Hunkuyi ( Kaduna north) and Danjuma Laah (southern Kaduna). El-Rufai said the senators’ rejection of the $350 million World Bank loan to the state is responsible for the non completion of some projects. He said the state government had initiated many projects with the hope of funding them with the loan which the senate refused to give its approval. “We initiated many projects this year because the World Bank approved a loan of $350 million to us and we were sure that we will get some part of the money this year,” he said. “We included it in our budget to be able execute our projects – schools, hospitals and the roads that we are constructing in the town. Well, you know what happened. The house of representatives approved the loan but the senate rejected it. When it was presented to the senate, our senators from Kaduna kicked against it. “The betrayal of Kaduna people by Shehu Sani, Suleiman Hunkuyi and Danjuma Laah is the reason why many projects have stopped. So I want the people to understand this. Anywhere you see that a road project has stopped, ask them. Anywhere you see that a hospital project has stopped, ask them. Anywhere you see that the construction of a school has stopped, ask them. 0 Response to "Saraki’s Leadership, Worst In The History Of The Nation- El Rufai"